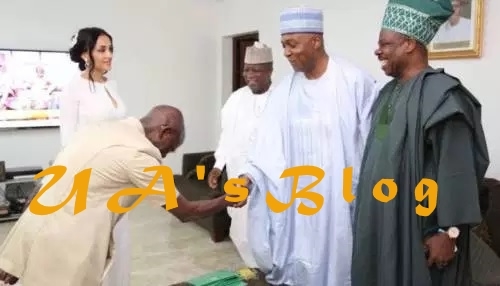 Speaking with journalists in Ilorin during the sixth remembrance prayer for his father, Senator Saraki, a former Governor of Kwara State, explained that Comrade Oshiomhole, the chairman of the All Progressives Congress does not even have any moral ground to continue to be in politics. Comrade Oshiomhole was recently questioned by the Department of State Security Service, DSS, over the conduct of the primaries held by the APC, the ruling party in Nigeria. The interrogation was said to have said to have been instigated by those whose candidate lost tickets in the primaries. Aisha, the wife of President Buhari is among those upset with the APC National Chairman. Upset by her brother’s failure to win the party ticket in Adamawa, Mrs Buhari came out to lambaste the ruling party. Last month, sources privy to the internal wrangling of the APC, informed DENISAURUS News that Comrade Oshiomhole was having a tough time. He was seen scaling a fence after members descended on the national headquarters in Abuja, following fall out from the primaries. Comrade Oshiomhole, a former Governor of Edo state who took over from John Oyegun has been accused of disorientating the party. A governor from the South East, who wished to impose his chosen candidate on the party is at loggerheads with Comrade Oshiomhole. Governor Okorocha also claims that Comrade Oshiomohole is the reason why voters are deserting the ruling party. The Independent Corrupt Practices and other related offences Commission has said it would investigate the APC national chairman over allegation of corruption that has trailed him since the primaries.